If you’ve ever shown livestock, you’ve most likely experienced the frustration of your animals going off feed. BioZyme® Inc., is excited to announce new products and some enhancements to its Sure Champ® line this spring because if your animals aren’t eating, you’re not winning. All Sure Champ products contain Amaferm®, a natural prebiotic designed to maximize the nutritional value of feed by increasing intake, digestibility and absorption. It is research-proven to increase water and feed intake. In addition, research shows that Amaferm decreases body temperature in heat-stressed animals. Sure Champ Extreme with Climate Control is one of the new products that BioZyme is excited to launch. This is a daily top-dress supplement that is formulated for cattle, hogs, sheep and goats and designed to help eliminate heat stress in the animals due to increased temperatures, high humidity or extreme shifts in temperatures or climate. In addition to the Amaferm, it contains plant extracts that support the animal’s ability to maintain normal body temperatures. Extreme also contains garlic, considered a natural insect repellent. Because Extreme with Climate Control is for all species, it is available in 50-pound bag and a 25-pound bucket with a scoop marked with the suggested feeding amounts. Not only is Extreme a great supplement for show livestock, it is also works as a good supplement for show calf prospects on fall sales, as you can add this to their feed to help them keep healthy and combat heat stress during the hot summer days. “In addition to being a great supplement for all species of show livestock, Extreme also serves as a great additive to be included in cattle rations. We feel the addition of this to your current ration will provide many advantages especially for those who market their calf crop in the late summer and early fall when temperatures can still be high and cattle are affected negatively from heat stress. The opportunity to conveniently add Extreme during these times will allow producers to help reduce stress and maintain normal body temperatures during high traffic periods when buyers are visiting to look at their sale offering,” Rodgers said. The second new product that will be available this spring is Sure Champ Ration Builder. This pelleted protein, vitamin and mineral supplement formulated strictly for cattle makes it easy and cost effective to formulate a high-quality feed when working with your local feed mill. Ration Builder is fully fortified, meaning it includes all the vitamins and minerals needed, along with Amaferm. It is ideal for producers and exhibitors to build complete feed programs for both creep and show feed rations. It is recommended to mix Sure Champ Ration Builder in your ration at a rate of 250-400 pounds per ton based on desired formulation and protein levels. Ration Builder is available in 50-pound bags. Sure Champ Cattle has been the foundation of the Sure Champ product line. This product is a pelleted, vitamin and mineral supplement formulated for beef cattle. This fully-fortified mineral supplement stimulates appetite and boosts overall performance – promoting added growth and bloom while enhancing skin and hair quality all while optimizing the animal’s overall health. It continues to be available in 50-pound bags. This is a daily supplement for cattle, and no changes have been made to it. 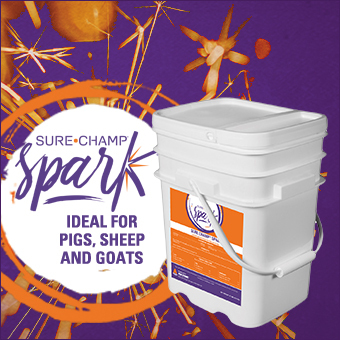 Sure Champ Spark is a daily, pelleted, concentrated nutritional supplement formulated for all species, but most ideal for pigs, sheep, and goats due to the low inclusion rate. Spark does not contain a vitamin and mineral package but contains Amaferm to keep your animals’ digestive health in check. Spark also contains MOS to trap and expel bad bacteria, limiting their ability to do harm, and includes biotin and zinc for additional hoof and hair care. Spark will come in a 25-pound bucket with a scoop marked with suggested feeding amounts. Be sure to read the label for new recommended feeding amounts. Sure Champ Climate Control helps all species of show livestock handle heat stress by lowering the animal’s body temperature in a safe, fast, and natural way. Climate Control includes capsaicin and plant extracts proven to help animals naturally regulate body temperature during heat stress. Climate Control also includes garlic, considered a natural insect repellent. Climate Control is a paste that is most effective when administered orally 5-7 days prior to traveling to a livestock show through the return home from the show. It is available in 80 mL tubes. All new products become available April 1. At that time, the Sure Champ Sheep, Goat and Pig Pellets will be discontinued since the same qualities can be found in Sure Champ Spark or Sure Champ Extreme with Climate Control.